At UCHealth, our multi-million dollar robot train allows us to run the top 50 types of test results as “stat.” This means when the blood arrives in the lab, it takes about 10-15 minutes, tops to run the blood test and report it into the Electronic Health Record so that doctors and nurses can act on that information. This robot combines with a fancy multi-channel pneumatic tube system that spans across multiple buildings, and transports blood samples drawn from patients in our Cancer Center, about a quarter mile away. Furthermore, our nurses print pre-barcoded labels specific to the patient and the request lab order, so there’s no mix up during transport. The 3 technologies together make it so that from lab draw to test result is typically less than 30 minutes. Compare this to the “old way” of human transporters who walk around between buildings every few hours collecting specimens, and lab technicians who run tests in batches, by hand, with lots of err0r-prone human transcription. You’d be lucky to see an 8am blood test return a result by mid-afternoon. Our lab technicians simply transfer the pre-barcoded tubes from the pneumatic transport canister to the robot intake rack. An articulated arm with camera spots the tube, grabs it, scans the barcode, puts the tube in a carrier slot on the railroad, and sends it down the track to the right machine in real time. Once at the machine, the centrifuge has 6 slots. At busy times, all slots fill up quickly and the spin begins. If there’s a backlog, additional tubes are re-routed to an alternate machine to start a new load in-parallel. If there aren’t enough samples to run a full load after 5 minutes, water-filled tubes are selected automatically to fill empty slots and the centrifuge runs. Brilliant! At the end of the line, lab tubes are stored in the automated Stockyard for 3 days in case of needed “add-on labs.” The seamless interface between the EHR and the lab system allows ordering physicians to be reminded “Do you want to add your new order to the existing specimen?” If yes, the robot retrieves the blood, runs it back up the railroad, processes the new order, with no human intervention. This ONE IDEA has saved 30,000 repeat lab draws on patients, in ONE MONTH, at our University hospital. Astounding. Faster for doctors receiving important results, cheaper for the lab, one less “stick” for patients. CMIO’s take? So cool. I wish =I= could ride the railroad. Or maybe it is time to retire and take up model trains. Does your organization have one of these? Or maybe you were a model train enthusiast? Let me know. 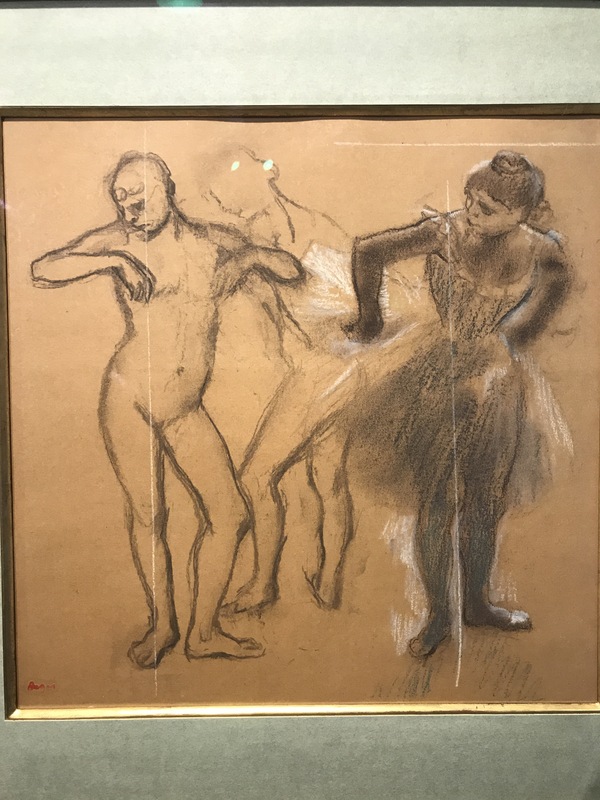 In a surprise event, our Anschutz Medical Campus in Aurora, Colorado announced an amazing art exhibit comprising Rodin sculptures, Monet, Renoir, and various other paintings, drawings and sculptures from a private collection. I discovered this in a small news blurb, left my office, and walked down the street to the single-room art gallery in the Fulginitti pavilion. I spent some time picking my jaw off the floor. Then I took my sketchbook out and begin trying to capture some of what I saw. What’s terrible is how infrequently I stop to smell the flowers. What’s mediocre is how poorly I draw. What’s fantastic is putting aside all concerns and focusing on one painting for half an hour. A few years ago, I very much enjoyed art exhibits AND I wanted to stretch myself, BUT I was afraid of being criticized, THEREFORE I silenced my inner critic and started sketching. What’s important is NOT the finished piece (thank goodness), but the experience of spending quiet time really LOOKING and SEEING and BEING PRESENT. It is incredibly peaceful and rewarding. Let me know if you’ve experienced something like this. Author CT LinPosted on May 24, 2017 May 3, 2017 Leave a comment on Terrible, mediocre, fantastic. Doodling. I recently gave a talk at the Health Evolution Summit conference in Dana point California. 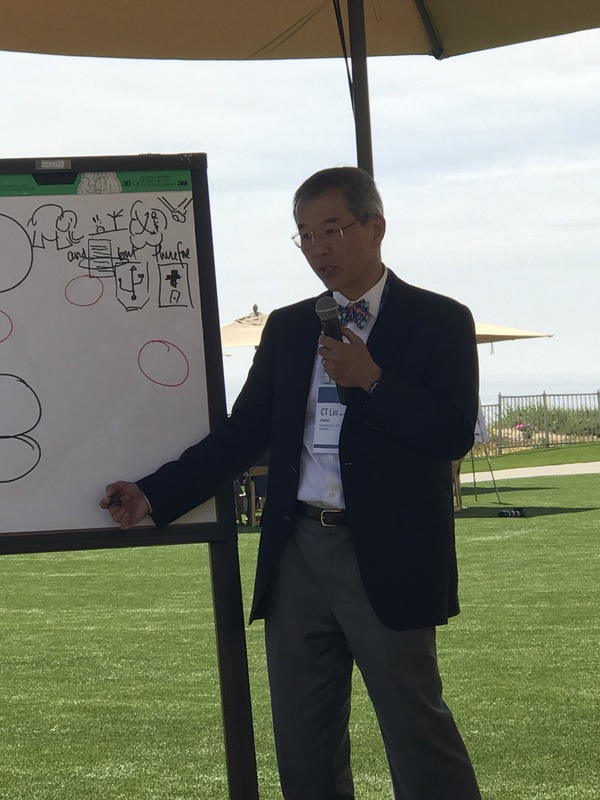 It was a humbling experience, as I was expecting to give the standard PowerPoint presentation, and was told: “no,” that instead, I would be out on the lawn in front of the wind and surf and be giving a talk on a flip-chart. This provoked a great deal of anxiety, and prompted ego- and personality-rebuilding. Then I thought of my sister’s book recommendation “The Doodle Revolution.” And so I took my story, boiled it down into symbols, and give a talk, which was not unsuccessful. Turns out, googling any concept attached to the word “symbol” allows you to see what other people have used for symbols, such as for “strategy” or “manager” or “project manager” or “consensus”. Try, for example, googling “consensus symbol.” Well, at least it starts the creative juices flowing. I challenge any of you to understand my chicken scratch doodles and interpret them into a coherent narrative. The good news is, I’m no longer afraid that my terrible chicken scratch will be criticized. I know that it will, and it’s still helpful to me and to my audience. I’m learning to get over myself. CMIO’s take: What are you waiting for? Get out and doodle! OR, if you’ve doodled successfully (or even unsuccessfully), let me know in your comments! “…and…but…therefore” I spoke about briefly on a previous blog post on storytelling. Read the book; this is just a taste of the great ideas there-in. Here’s a counter-example of non-story-telling that illustrates why “And-But-Therefore” is better than most scientific or business write-ups and summaries, that end up being a list of facts “And-And-And.” Can you imagine the Wizard of Oz being an And-and-and? I find myself saying “So what?” — I probably wouldn’t read that book. The NYTimes “dot-earth” blog is a fan of Randy’s as well. Also a worthwhile read. CMIO’s take: What is YOUR “…and…but…therefore” story? I like drawing on white boards. As an introvert, I often delay making comments during meetings. 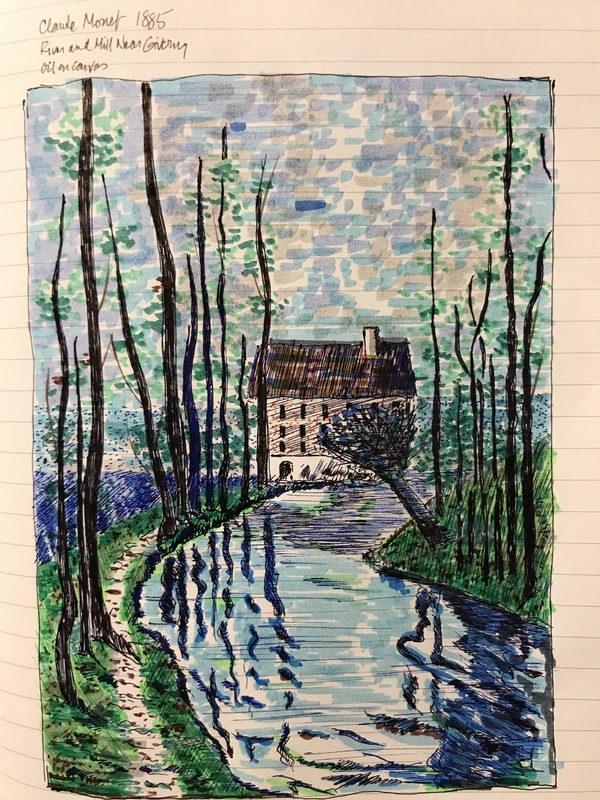 Sometimes I doodle in my note taking (which I’ve started to do more on paper, moving AWAY from Evernote, or OneNote or other online phone-based or laptop-based tools; more on this another day). This book has emboldened me to take my not-ready-for-prime-time doodles and put them up in public (or at least on white boards in committee meetings). What I do like about meetings is hearing viewpoints, especially those well-thought-out points. I like noodling on them, considering alternatives, categorizing parallel conversations, and problem-solving in my head as the meeting progresses. I’m not one to jump in with both feet and steer things, as I like watching things evolve. Sometimes meetings have a good leader, or a good participant, who will actively steer the conversation toward a concrete and productive resolution, and I am happy to keep quiet, and if it is a team-member, I give them kudos for a well-run and productive meeting. Sometimes, we get together and the wheels start wobbling, and threaten to come off the bus. People are arguing, stating points of view repeatedly, or adding new topics when existing discussions aren’t even clear yet, and soon we have 4 or 5 buckets of discussion and we’re talking past each other. I used to hate these meetings, which sometimes ended up with “seems like we need another meeting to resolve this.” In recent years I’ve learned that I can step in, and make a summary statement, when I feel like most of the viewpoints have at least been initially aired. Then my favorite part begins. “So, it seems like we have 4 buckets to discuss. First, the timeline for this change, second, that not all participants are in agreement, third that the software isn’t really ready to handle 2 special conditions, and fourth that the proposed mobile version just does not work at present. Are there any other buckets I have not considered so far?” This usually shuts everyone up, while they consider that SOMEONE has been listening and not just yammering. I enjoy this. Then I play air-traffic control: “OK, so lets start with bucket 1 and defer the others for a moment. Can we agree that the timeline should have a kickoff on March 12? That part seems straightforward. OK?” And then parse the discussion down into buckets and walk through them one at a time. This works reasonably well. Well, having read this DOODLE book, I find that we can kick this up a level. I do enjoy a good doodle when brainstorming at home, but this book is empowering, and breaks down doodling into component ideas. Practice shapes! Here are some ideas for organizing frameworks with convenient sketch-equivalents! How to draw a simple expressive face! how to draw a human and not be (too) embarrassed about it! How to represent lots of ideas visually! How to group and link ideas so that everyone can follow (or add their own ideas)! So, now, I’ve taken to standing up during the middle of meetings and heading to the white board while others talk. I don’t LIVE-SKETCH like I’ve seen YouTube videos do of important discussions, but I can sure draw and crudely illustrate my buckets. I’ve found that people start gesturing at the board during the rest of the meeting, that some get up and make additional helpful marks, and we can come up with better ideas with a shared vision. Only a few weeks into this change, and I can say it has made my work life better. Maybe even helped the organization. Learn to Doodle. Use it. Enjoy it. Join the revolution. Clarity needs all the friends it can get. For in-person meetings, there’s nothing better to cut through the noise. I’m interested in hearing from colleagues: how can we effectively doodle during online Skype or Zoom or other web-based meetings? I’ve not found a good answer to this question. Perhaps: set up a blank powerpoint slide, share your screen, and sketch (poorly with mouse)?